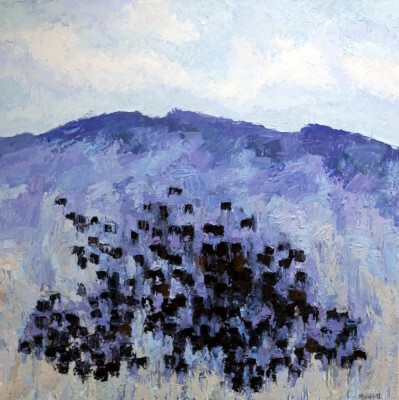 Altamira Fine Art Jackson is pleased to welcome Montana artist Theodore Waddell for a highly anticipated solo exhibition opening August 21 at our Jackson Hole gallery. Please join us Thursday, August 31st from 5:30-7:30pm for an artist reception and book signing. The new book, Theodore Waddell: My Montana, Paintings and Sculpture, 1959-2016 is richly illustrated with the artist's work, as well as images from his personal archive. The book traces Waddell's early influences and career development. Authored by Rick Newby, the book also includes essays by Montana curators, scholars, critics, poets and fiction writers who know him best. The 288 page paperback book is available at Altamira Jackson in advance, as well as the night of the reception. Theodore Waddell is one of the West's most celebrated contemporary artists. His new exhibition will include works on canvas and paper, including his signature richly textured horses, cattle and striking landscapes. Theodore Waddell was born in 1941 in Billings, Montana, and raised in Laurel, Montana. He studied with Isabelle Johnson, Montana’s first modernist painter, before earning a scholarship to study at the Brooklyn Museum of Art. He received his MFA from Wayne State University. Waddell's sophisticated modernist paintings have attracted widespread recognition. 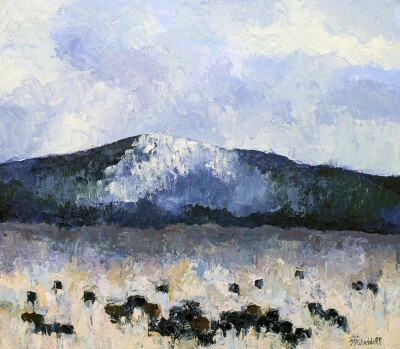 A former cattle rancher, Waddell most often paints freely rendered range animals roaming the vast plains of Eastern Montana. His art draws a deliberate parallel between his subject and abstract art elements. Cattle and horses are motifs arranged formally on the flattened and enveloping painted “ground” characteristic of modernism. While his early works were noted for heavily textured surfaces, Waddell’s recent paintings are more atmospheric, with translucent wax medium layers suggesting the drift of grazing animals, transitions of days, and the movement of seasons. 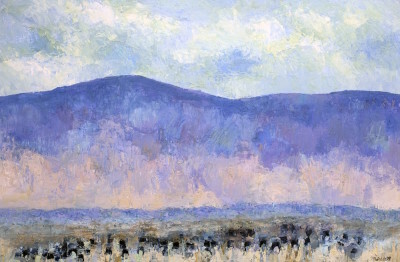 Waddell’s paintings represent diverse approaches, styles, and techniques. There are cattle or horses dotting expansive plains. Some are huddled together in winter blizzards, lost in landscapes of thick paint, under the windswept colors of a rising moon. They are brushed, knifed, dripped, jotted down, and can be thickly textured or feint abstractions. His work is included in the permanent collections of the Denver Museum of Art, Los Angeles County Museum of Art, Booth Museum of Western Art, Buffalo Bill Center of the West, and the National Museum of Wildlife Art, among others. Theodore is the recipient of the 2015 Montana Governer's Arts Award. The 288 page book, Theodore Waddell: My Montana was released in 2017 and features paintings and sculpture from 1959-2016.